Is this the first time Batman met Zatanna? She kind of looks more like a villain in that costume. Are you serious about whether it was the first time Batman met Zatanna? That issue of B&tB was cover-dated December 1980. Batman originally met Zatanna (as Zatanna) waaaaaaaaaaaay back in Justice League of America #51 (February 1967). But he had previously encountered her (in disguise as "The Witch") in Detective Comics #336 (February 1965). Great to see the thread back. I've been loving Zee in JLD. I also really enjoyed her scenes in this new season of Young Justice. My name is Wally West. I"m the fastest man alive. I"m the Flash. Favorite Heroes - 1-Flash/Wally West, 2-Superman, 3-Green Lantern/Hal Jordan, 4-Nightwing, 5-Hawkman, 6-Firestorm, 7-Supergirl/Linda Danvers, 8-Zatanna, 9-Robin/Tim Drake. She kind of looks more like a villain in that costume . They 'sort of' met during Zatanna's Search. Then after that all their interactions were as part of the JL. Though she interacted primarily with Barry, Hal and Ray. This is the first time, I think, where it was just Batman and Zatanna. She was written as kind of an idiot in this particular issue though. Well, the most this could mean is that she's in a large group shot doing hero things and he doesn't really write her in a significant capacity. 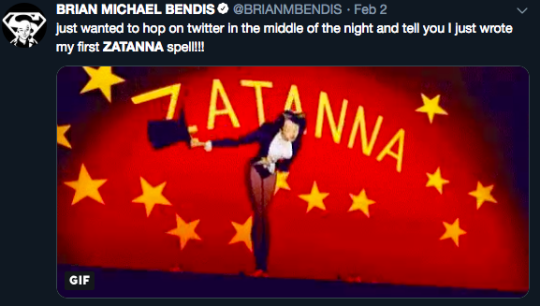 Granted, knowing how he wrote Scarlet Witch, I can't say I'm eager to see Bendis write Zatanna. (Good image of her thought). Maybe she's guest starring in Superman or Young Justice? Although, and don't hate me, but I'm actually kind of on board with a Bendis led Zatanna book. I'm not as against him writing her in some capacity, but a solo book? Not so much. I think Tynion is doing a decent job writing Zatanna, although I prefer her written more upbeat and in brighter circumstances. I do think Bendis would be a fine fit if they could just take out the annoying Bendis talk. Paul Dini still did the best job with Zatanna from what I've read. The Dini Zatanna omnibus was in Comixology sale a few months ago...so decided to “risk” buying it. I think it’s up there with best modern DC series, up there with like of Brubaker run on Catwoman. Is that a preview for this week's JLD? Looks good. Also love seeing the three demons. Classic Silver age JLA baddies. Nice touch Tynion. Nice. I started reading it awhile back but wasn't able to finish it. Still on my list though. But what I did Rea was pretty good. Dini really put in effort in making Zatanna and her world feel very fleshed out. Covers were great as well.